Your personal brand statement is the building block of your personal brand. Think of your personal brand as what sets you apart from other professionals in your field. You’re not just another accountant, or writer, or public speaker, or project manager, or whatever it is you do for work. You are a unique person with a combination of skills, traits, and experiences that separate you from the pack. That is, everything you have to offer cannot be found in anyone else. How you package yourself in your career is collectively known as your personal brand. A strong personal brand establishes your place in a field and promotes your expertise. If you take your career seriously (and you totally should), you want to have a powerful personal brand in place. It can make all the difference when it comes to finding work, building a network, and creating new opportunities in the future. And all successful and cohesive personal brands start with a personal brand statement. Your personal brand statement is short, typically no more than a few sentences, but will set the tone for your entire personal brand. No pressure, right? Don’t worry. And don’t overthink it. You can easily break down your personal brand statement so you’ll never second guess if you’re doing it right. Remember, your personal brand statement is unique to you and you alone. Essentially, it sums up what you bring to the table career-wise that no one else possibly could. The last time someone asked you what you do for a living, what did you say? Chances are, without a personal brand statement developed, you simply answered with your job title. Or, if you have a job title that isn’t common or well known, you might stammer and vaguely describe what you do but not what makes you unique or who you help. A dull answer, like the ones above, do not leave a lasting impression. And they certainly don’t help people get a true feel of what it is you really do for a living and what makes you uniquely you. Being another teacher, accountant, sales rep, or receptionist doesn’t help you stand out. And, remember, your personal brand statement is meant to help you stick out in your field. To be successful today, you need to identify what you do best, for whom you do it, and why you do it better than anybody else. 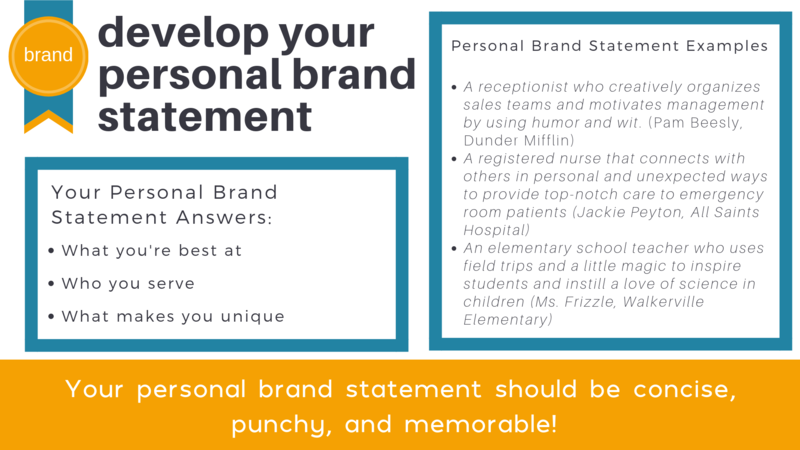 These elements are the essence of your personal brand statement which should be punchy, genuine, and memorable. 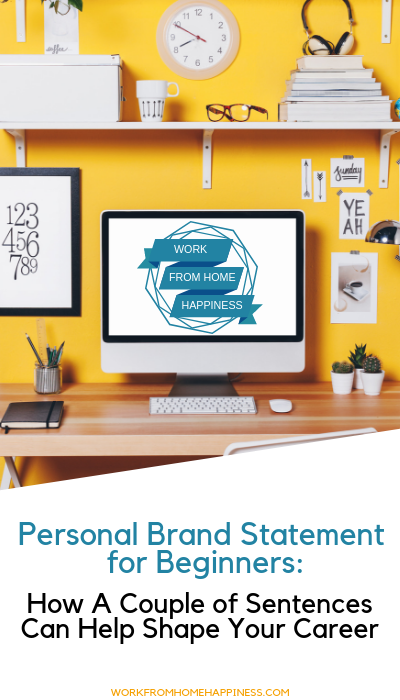 Ready to write your all-important personal branding statement? First things first, you need to toot your own horn. What are you the best at? This isn’t the time to be humble. Instead, grab a pen and piece of paper and start jotting down your strengths. Your strengths can be both soft skills and hard skills. As a quick reminder, soft skills are those you inherently possess, like compassion, organization, interpersonal abilities, etc. Hard skills are those that are learned and can be measured. Think of things like Photoshop, writing, language proficiency, etc. Don’t go overboard here. Narrow down your top three skills that you feel you’re the best at when it comes to work. You’ll incorporate these into your personal brand statement to concisely show what you do ridiculously well. Now we’re going to identify your target audience. Your target audience are the people you serve (or want to help). Let’s say you’re a sales representative for a software company that creates patient schedules for doctor’s offices. In this case, your target audience would be medical professionals like doctors, nurses, and physician assistants. Maybe you’re a paralegal. You specialize in stepping up to help attorneys who are overloaded with casework but don’t have a need to hire a full-time or part-time paralegal. Your target audience would be solo practitioners and small legal teams. Now, take a second and think about who you serve in your career by using your unique skills and traits you’ve already listed. This is your target audience. You’ll mention your target audience in your personal brand statement to help others understand who you work with and can assist. What is a Unique Selling Point (USP)? Your USP is a promise that you make to your target audience. Your brand fulfills this ‘promise’ to your target audience by using the skills and traits you already identified. Your USP clearly defines what makes you special and guides you in how you live up to your personal brand. I am regarded for my passion, enthusiasm, and creativity in recruiting. I serve all clients with respect, provide individual attention, and reinforce progress with positive regard. I am an expert in the recruiting field and use my knowledge to help job seekers find their dream jobs. Those I work with appreciate my candor, advice, and trust my guidance during career transitions. Remember, you must be able to deliver on your unique selling point! In other words, don’t overpromise. It’s indefinitely better to underpromise and overdeliver than to fall short. You’ve got your traits and skills that you do amazingly well listed. Awesome! Now how do you put it all together into a concise and memorable personal brand statement? There is no one-size-fits-all approach to personal brand statements. The tone of your personal brand statement should feel authentic to you. It will take some writing and rewriting to get it just right. Remember, to include what you’re great at, who you serve, and your unique selling point. As long as you can do this in a sentence or two, you’re golden! It’s not set in stone! You can edit, change, tweak or scrap your personal brand statement at anytime. Most careers are fluid. And your skills, interests, and audience will likely change over time. That’s okay. Update your personal brand statement to keep your brand consistent. Once you have your personal brand statement down, congrats! Use it everywhere. Display it on social media. Share it with your friends. Let it be your intro when you meet someone new. And, of course, let it drive the rest of your personal brand. Take the next step by DIYing a personal website that takes your career to the next level. skill set in proofreading and formatting of text or documents to be excellent. In addition to the companies listed, would you recommend jobs for editors.com? My background is sales management and I have prepared many a sales proposal with global IT companies. I would welcome your thoughts or input.